Responding to numerous calls from parents of children being bullied at school, Michigan law firm Buckfire and Buckfire created the infographic below, detailing some shocking bullying statistics in the United States. For example, 280,000 students are physically attacked in secondary schools. Every month. Consider the implications of this statement. First, there are serious psychological consequences for all students – bully, target, and bystander – in the climate of fear created in threatening, poorly-protected environments. Second, there is a proven connection between lowered student performance in schools with the most bullying – the more bullying, the lower the test scores (“The Impact of Bullying Climate on Schoolwide Academic Performance,” A Lacey and D Cornell, Curry School of Education, University of Virginia, presented at American Psychological Association Meeting, Aug 2011). This recent research supports the older, frequently-quoted statistic that 160,000 students miss school daily due to fear of bullying. Here’s another one: Every 7 minutes, a child is bullied on the playground (I think this statistic is low – more like every 7 minutes on every playground in every school). How can this be? How can so many anti-bullying initiatives collectively have had so little impact of the incidence of bullying? Simply put – it’s not about the bullying prevention program. Bullying prevention is easy and effective if you intervene early – at the first sign that someone is being hurt or excluded. It’s everyone’s responsibility – students, teachers, school administration, parents, & community leaders – to catch bullying at its first appearance and intervene with firmness & kindness – don’t bully the bully! You don’t actually need a program. A simple “Oops. You crossed the line. We don’t treat people that way here.” is all that’s needed. Everyone makes mistakes, but there’s a big difference between the occasional mistake – caught quickly, apologized for, and future behavior changed – and an environment where adults either turn a blind eye until there’s a crisis or go through the motions of bullying prevention but kids know that bullying is tolerated. 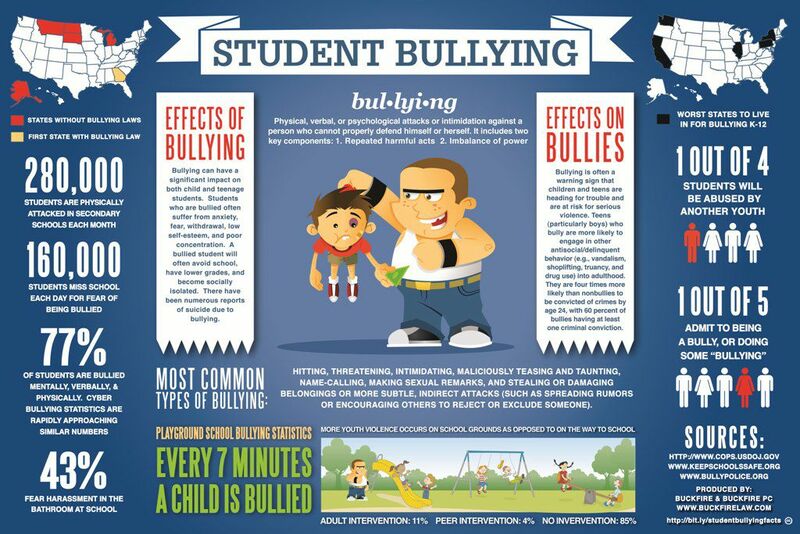 In the infographic below, bullying is defined as (1) a 1-way, permanent power differential between bully and target and (2) repeated harmful acts. The power imbalance is always present in bullying, and bullying left unchecked does indeed tend to repeat and escalate. Don’t, however, ignore the single act of bullying. Kids need to know that adults are watching every day. Eventually, when kids understand that there really is a firm “No Bullying” policy at the school, they will internalize this standard, test the boundaries less, and start standing up to protect peers, making it less the adults’ sole responsibility. What can we all do today? Especially as we head back to school, it’s a great time to open a new chapter. Bring fresh eyes to our homes, schools, and communities, look again and become aware again of the everyday, small building blocks to bullying. Think about how you might help raise awareness and intervene early to reduce this epidemic of bullying. Make every day bullying prevention day! Share your stories – we love to hear about both your successes and “oops, we learned from this” moments! Student Bullying in the United States Statisitcs and Facts by Buckfire & Buckfire, P.C. is licensed under a Creative Commons Attribution-NoDerivs 3.0 Unported License. Bullying is such a huge problem. I am not sure I understand why people need to hurt others and I am so against it. I have tried to raise my girls to not bully another person and if they get bullied to walk away from the situation and get an adult involved. Unfortunately, as I have experienced some adults allow this type of behavior. The statistics are frightening and sad. I agree that kids need to know that adults are watching and that there is a firm no bullying policy at schools. Thank you for the info and for the stats about bullying. The image that you have provided in your post is excellent! Lorna, what I haven’t seen anywhere–and truly don’t have a clue about–is whether there is an escalation of bullying in the schools or if it’s just being reported more because we’re more aware of it … its consequences. Do you happen to know? And if so, what do they attribute it to? Sharon, this is a great question. In fact, it is such an important question, I am going to address it in another blog post! Great points … the intervention early is very important to stop bullying at school. Thank you for sharing this information. Great points here.. so hard to believe that bullying is so common. It saddens me to think about, but, we as adults have a responsibility to be informed. Thank you for sharing! Great post Lorna! It is so important to address these things early. What’s so mind-boggling about all these bullying-prevention programs is that they seem to fall so short of “nipping things in the bud”. Simple remarks that force bullies and bystanders to take social responsibility for their actions are key. People NEED to be educated about when they “cross the line” and face up to it. Another insightful piece from you!